I don't know of anyone who likes pasta that does not prefer homemade--if they've ever eaten homemade. 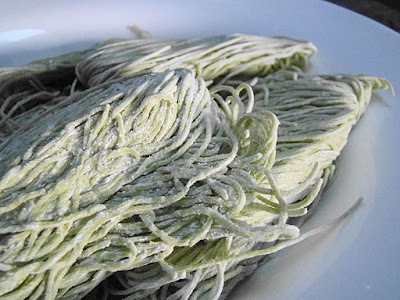 One my favorite pastas is a vegetable pasta: spinach pasta. Spinach pasta works in almost any dish that calls for pasta. Simmer spinach in water until tender. Pour cooked spinach and water into a blender and blend. Add egg and blend until thoroughly mixed. Put into a stand mixer bowl. Add the flour to the spinach and mix on low speed to make the dough. If it crumbles add water 1 tsp. at a time. Change to a bread hook and knead for 1 minute. Break the pasta dough into 4 or 5 pieces and run through the pasta roller at the largest setting to make a long flat dough. Put through the roller several times until the dough is smooth and elastic. Change to a pasta cutter. Set it to the size pasta you want, and put the dough through the cutter. For later use, spread pasta on a rack to dry. After the pasta is thoroughly dry, store in an air tight container until use. When you cook it, cook in boiling water for 7 to 10 minutes. If you are cooking it immediately, it will not need to cook more than 3 to 5 minutes. you know it is healthy! Do you enjoy making homemade pasta?